I have a confession to make. I lust after fabric. There, I said it, okay?! Geez. That's how this project started. I lust after fabric. In particular, I lusted after this fabric. 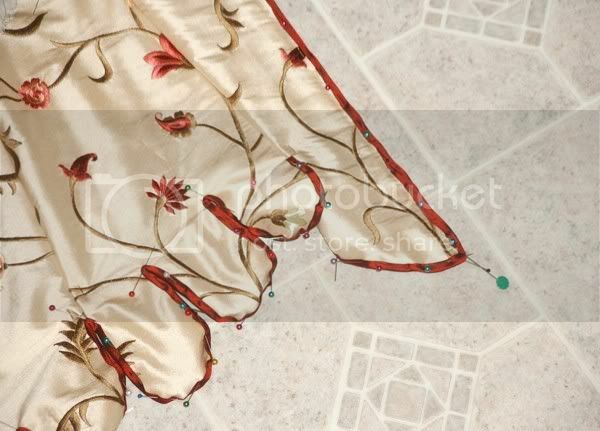 It's a cream-colored silk, embroidered with olive green leaves and vines with pink and maroon flowers. Once again, it's a Hobby Lobby find--forty-five dollars a yard. Forty-five! Despite the price tag, I decided I must have some. And that I had to have enough to make something wearable out of it. "Aha!" said I. 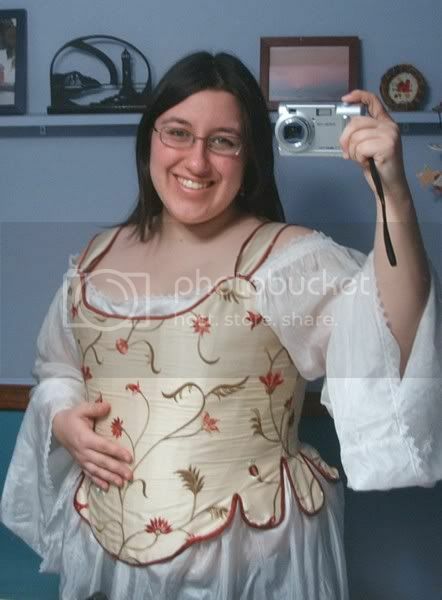 "Corsets don't take much fabric!" So I bought two-thirds of a yard of it...and then it sat in my cedar chest for a really long time because I was too scared to do anything with it. Anyhow, I didn't really have the confidence to cut into the embroidered silk until just recently. In the meantime, I drafted my own corset pattern for an 18th century pair of stays, using the Custom Corset Pattern Generator, which is actually the same pattern I used as a base for my Venetian bodice. As you can tell, I'm a fan of the custom pattern generator thing. I've used the same pattern for my Venetian, a corded corset [which I have yet to a) finish, b) build a webpage for], and now these stays. Back when I drafted the pattern, I had some scraps of cotton duck canvas lying around and wanted to see if I could fit the whole pattern onto those few scraps. I could, so I just went ahead and cut it out. The whole shebang then sat around for, oh, probably a year or so before I decided I wanted a new pair of stays. I was going to be all ambitious and get them totally constructed over Christmas break 2005. That, obviously, did not happen. However, this time it's not my fault. I got sick. I got a very nasty cold that made me totally useless for a full week, and then mostly useless for two weeks after that. Toward the end of break, as in, six days before classes began again, I went to Gwendolyn's house for a sewing day. Among other things, I cut out the silk lining while I was there. It's a tan silk dupioni, also from Hobby Lobby (what isn't from Hobby Lobby anymore?! ), that is actually much prettier than I thought it would be. I always forget how lovely silk is, even when it's a rather plain color. I now want a bonnet out of the tan silk, but that's a whole nother project. For another week or so, I spent an hour now and again sewing boning channels. I'm constructing my stays like Jenny la Fleur did for her Diderot stays. This is a big step for me, since I'm usually very obsessive about having nice neat insides on all my garments. This way, though, you sandwich all the layers of the corset together and then sew the pieces up, so that the seam allowances are exposed on the inside. If I just can't stand it, I'll sew some bias tape over the raw edges, but the point is that with the seams exposed like that, it's really pretty easy to make alterations further down the road. Oh, and speaking of bias tape, do you know how hard it is to find a nice dark red color bias tape? No? Well, let me tell you; it's really hard. 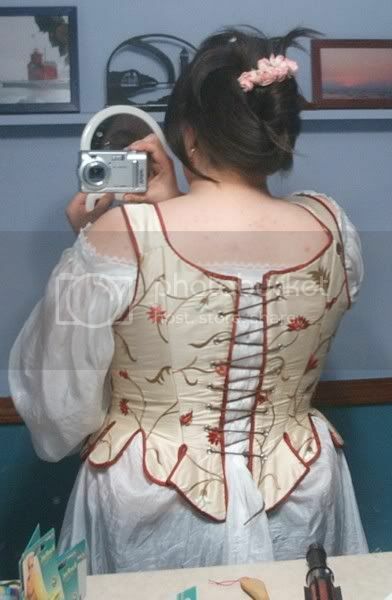 I wanted maroon binding for this corset, to match the maroon flowers on the embroidered silk. Wright's binding was a) not available in a dark enough color and b) poly/cotton. Closeup of the center back binding, before it was sewn. Well, okay, a week more or less. I finished binding the corset over the weekend and decided that I was going to go with grommets rather than hand-bound eyelets for lacing. Reason? My hand-bound eyelets are really ugly. I don't want this corset to be ugly because the silk is so gorgeous I don't want to screw it up with my sloppy eyelets. So I ordered a size 00 grommet kit from Corsetmaking.com and I'm very pleased. It arrived three business days after I ordered it--I placed my order very early on Sunday morning and I had the kit in my grubby little mitts by Wednesday--yesterday--afternoon. Well, more like Wednesday evening, since I didn't get home from school til six, but it arrived that afternoon. I spent last night setting grommets and I then wore the corset to class today. Yeah, yeah, I know. It's under a dress, and I wore it in order to do a presentation about it in Spanish this morning. It's quite comfortable, although I spy some places around the edge where the silk lining layer has little fuzzies that have popped out from under the binding, but a few quick hand stitches ought to fix that, I think. I'm very proud of it and of the fit. I'm not sure if it's because this pair of stays fits so much better than the last one or what, but now the dress is a bit too big. So I'll have to move the fastenings on that when I get a chance. 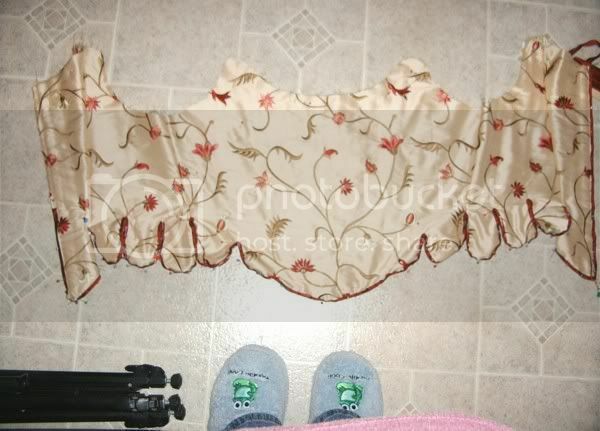 The front--I didn't have a nice ribbon for the shoulder straps at the time, so they're just pinned. And the back. Note the even lacing gap. I'm quite proud of that!